So the snow is coming here in Canada. As it does every year. Still every year us Canadians are not ready for the dreaded season. Will it be snow today? Maybe freezing rain? Maybe -40? Its always a surprise! But this year is also the first winter for our hens. Very exciting and yet very scary. There are always horror stories about coop fires and chickens dying of thirst etc. So we were determined to get our coop winter ready! I would like to brag that we got it done before the first snow fall, but alas… that is not the Canadian way. Snow tires am I right? When I was designing the coop, I went based on some different ideas that Pinterest gave me. I researched for days. Well for over a year really. Before we even bought our property I was planning and dreaming of our coop. One thing that my husband was adamant about was that we insulate the coop. That seemed silly to me. None of the coops on Pinterest were insulated. But he did make a good point, not all those coops are made for Canada in the middle of a cornfield. So we spent the extra time and money (not too much extra money to be honest maybe $40) and insulated. We just glued some of those foam insulation boards to the exterior walls ad then put a sheet of plywood over top so that the ladies wouldn’t eat the foam and for ease of cleaning. Let me tell you, those chickens are toasty in there! Worth while investment for sure. Don’t tell my hubby I said that. All summer we thought the coop was done. All good. Until the rain came in sideways in Fall and proved us wrong. They rain showed us every nook and cranny that was open to the elements. So with some craftiness and a roll of adhesive foam weather strip, we got to work on improving the coop. Now for a little background info about chickens, they are naturally winter ready. Depending on the breed that is. Some are heartier than others. They fluff their feathers and warm themselves perfectly. Meaning that those adorable Pinterest chicken sweaters are actually useless, as they stop the chickens from fluffing and also trap moisture, leaving them cold. The cold is not the chickens only enemy, dampness and drafts are too. 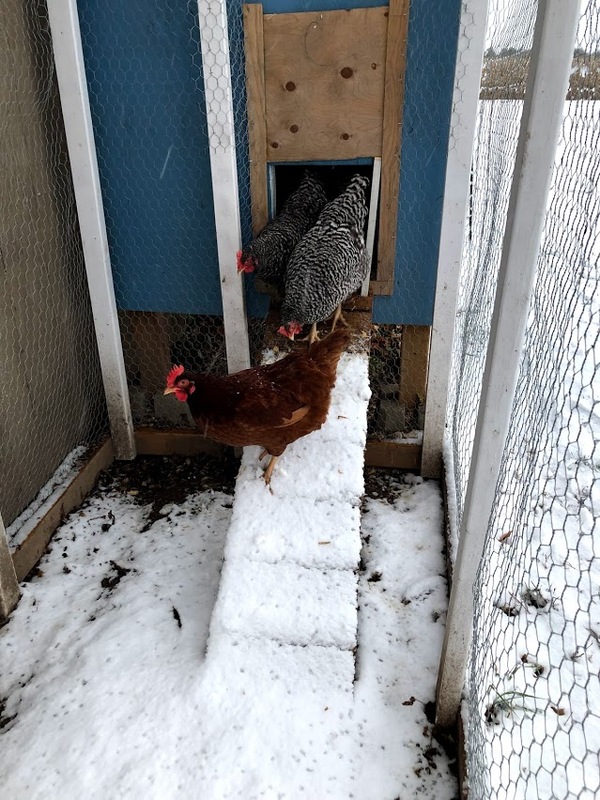 So it is very very important to seal up all the little nooks and crannies in your coop to keep your chickens toasty. So back to fixing, we had to change the door around a bit so that it overlapped the opening better to seal out rain/ snow/ wind. Instead of the drop down style of chicken door, we opted for the open upwards style with a piano hinge. We then surrounded the opening with the adhesive foam so that it would create an even better seal. We then did the same with the window and the top of the nesting box. When the rain was coming sideways, those nesting boxes were a hot mess. On top of the nesting box as well, where the lid meets the outer wall, there was a small gap that kept letting in rain. So we came up with the idea to use an old inner tube of a bike tire, cut it, and with staples and some silicone, we sealed the gap, while maintaining function. Problem solved! But Amy, what about your heater for your chickens? No no. Not in my coop. I have read too many horror stories of coops burning down, killing entire flocks. No thank you! Now this seems to be a hot topic in the chicken community, but this is my opinion on the matter. I have also ready many chicken keepers having issues with their chickens not wanting to venture away from heaters because they get acclimatized to the warmth and don’t want the cold. I don’t blame them honestly. There are also things like water heaters, also a cool idea. Very convenient. But again, cords for chickens to peck. I have read articles saying to add salt to the water to prevent it from freezing, or putting out hot water in the morning and again in the afternoon so that it takes a while to freeze. I plan on putting many different methods to the test this winter. I will let you know what I turn up! The basics for keeping your chickens healthy and happy over the winter seem to be pretty simple. So with that said, I wish you all a safe and happy winter season. Keep on dreaming of spring and the return of eggs! Comment with your best winter chicken tips or send me pictures of your chooks enjoying the snow! I can never get enough chicken pictures!